Edward Hopper was an American realist painter. He was born in 1882 in Nyack, New York. He was raised in a middle class, Baptist family, mainly by his mother, grandmother, sister and even maid. He died in 1967. Hopper depicted contemporary America, capturing the feel and mood of the time. The main feelings in all his paintings are solitude, introspection, secrecy and silence, mirroring Hopper’s own personality. He met his future wife Josephine Nivison Hopper in 1923, who from then on would be his only model. His oil painting Girl at Sewing Machine from 1921 depicts a young girl sewing by a window in a sunlit room. It appears to be in New York as we can see typical yellow bricks through the window. It is one of the first of many of Hopper’s “window paintings”. Hopper’s decision to pose a young woman against her sewing is said to be his commentary on solitude. The painting measures 48cm x 46cm and is in the Museo Thyssen-Bornemisza, Madrid. This is painted two years before Hopper met his wife. So who is this Girl at the Sewing Machine? I’m going to call this New Yorker ‘Betty’. She seems young, perhaps 20 years old. She’s not married. She daydreams about Rudolph Valentino she saw in The Sheik the other day, and laughs at this new funnyman Charlie Chaplin. Out on the streets she can sometimes hear jazz, who has just reached New York from Chicago and New Orleans. 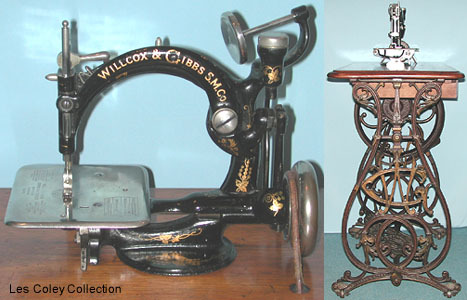 Her sewing machine is a treadle, a Willcox & Gibbs Automatic, which was a very successful chain-stitcher brand from United Kingdom. Read an incredibly detailed history here. These were manufactured from 1857 (when the partnership began) to 1917. I’d like to think hers is from 1881, as it would then be as vintage for her as my Elna SU 62C from 1973 is for me. 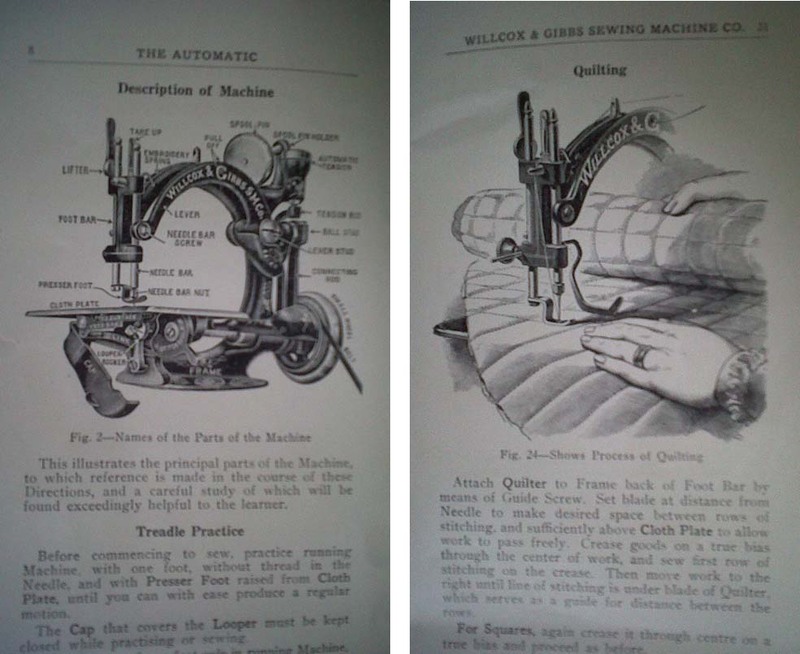 “Beyond all comparison, the HANDIEST Household Sewing Machine, Quiet, Elegant and Useful – it does the BEST WORK, and does it MORE EASILY than any other Machine – Hand or Treadle. Testimonial: Miss Headdon desires to state that she has used Willcox & Gibbs machines for over 20 years, and she’s had the utmost satisfaction”. (She’s also the one to send your orders to, so she would say that). So what is Betty making? The fabric is cotton, and has quite a bit of weight. God help Betty if it’s wool in this heat. Rayon is only a few years into the future. 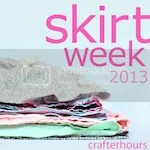 She will be hot in it, it’s a glorious summer, and she’s working in only her petticoat and is sleeveless. Luckily for Betty, breathless-making corsets are now a thing of the past. Vogue, Harper’s Bazaar and The Queen are the fashion magazines for Betty. 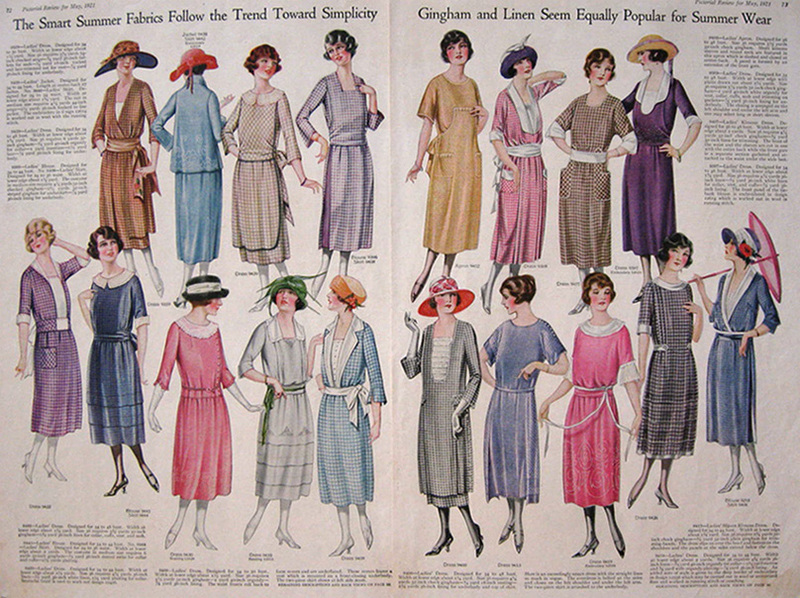 What she sees around her are loose waistlines (placed on women’s natural waists, but will in a few years have dropped considerably for what we now associate with the 1920’s), long hemlines, full skirts. Free, floaty, baggy styles. Although the zip had been invented, it was still all about buttons. 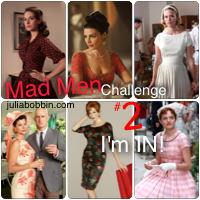 She’s picked the apron dress (2nd page, top left). It’s going to be utilitarian, yet stylish enough for going about her daily business and perhaps Sundays spent in Central Park. So long, Betty! Hope you can overcome your feeling of solitude and enjoy the decade that is the first one to emphasise youth over the older generations! 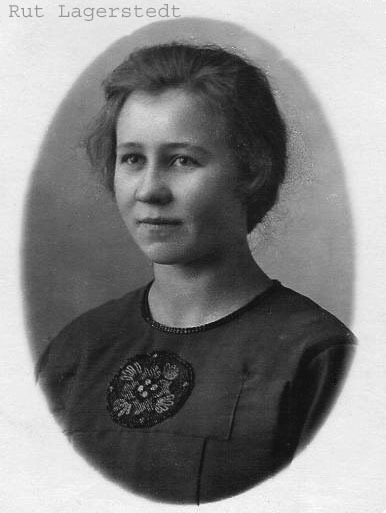 My paternal grandmother aged 18 in 1921. I had been on the lookout for the perfect skirt to have as a wardrobe builder and base for some dress pattern drafting, and then it came: Sewaholic’s Hollyburn skirt. Just after Tasia released the pattern, Rachel at My Messings hosted a sew-along, which I took part in. The pattern is for beginners, so I took the chance to work on some more advanced techniques. My main fabric (wool/cotton blend from Goldhawk Road) was the perfect red, but had more drape than I wanted. It was also slightly sheer, so I underlined the skirt with light green silk organza. I used this ingenious, mind-blowing method, where you underline and finish the seams in one go, making it look like you’ve used a hong kong finish. This was quite difficult, as it required absolute precision. 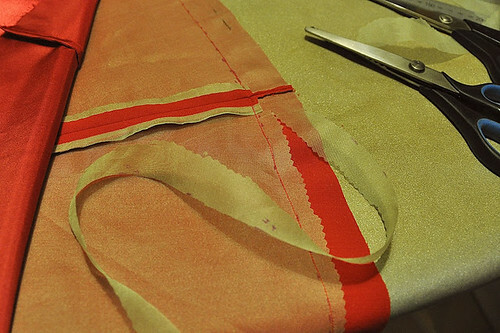 The seam allowances needed to be exactly 6mm, which was more difficult because the silk organza is so slinky dinky. Over 6mm, and the main fabric didn’t have enough space to lie flat once turned round to its right side, under 6mm and the finished binding was protruding the main fabric edge. If nervous (as I was! ), go under 6mm, rather than over, because if your main fabric can’t lie flat after the underlining has been sewn on, you can go fishing instead. I did a test before which turned out perfect, but it was a lot harder with bigger pieces. I had eight seams to do, and I only felt in control the last bit of the last seam. I made the hem allowance 5cm. I like to sew a seam one or two millimetres below the hem foldline, as it really helps when pressing the hem (it works a little like an understitch), especially because it holds the two layers of fabric together. Let’s call this hemline stitch. I got help from Gertie’s perfect tutorial on how to hem a full skirt, and from this incredibly useful guide on all hemming. 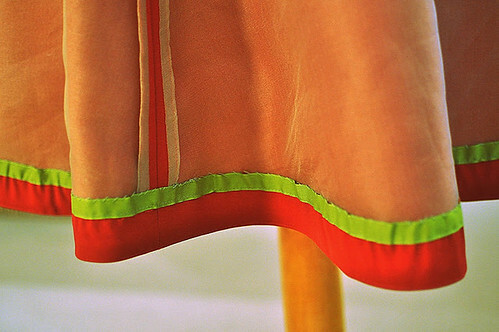 Fold and press the hemline, making sure the hemline stitch is on the inside of the skirt. Just use the tip and only press right at the bottom of the hem. Run gather stitch in sections along the edge. Place flat on ironing board. 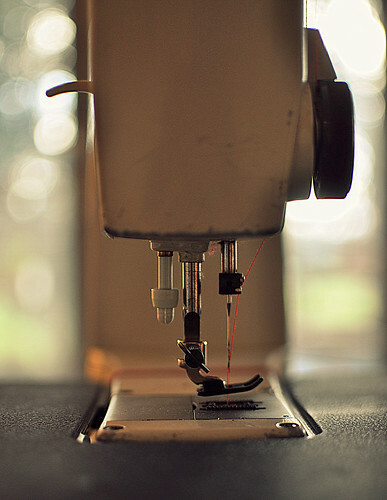 With a pin, pull up the stitches here and there to make the hem fabric excess lie flat. When I didn’t seem to be able to reduce the bulk any more, I hand-basted on the apple green seam binding, took it to the machine and sewed it on. I then hand-stitched it to the organza only (yes, the stitches that look like I roped in a five-year-old. Practice makes perfect). I lined this skirt in red polyester satin. The pattern doesn’t include lining instructions, but Rachel covered it in her sew-along. 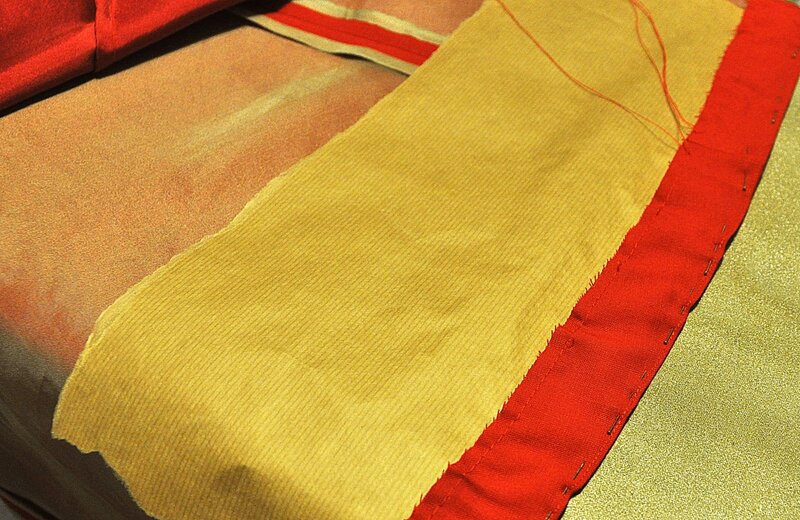 Seams are finished with French seams (apart from the one where the zip will be inserted. I just zigzagged the seam allowances together – I SO regret this – I should have bound them with bias tape to match the french seams). I inserted the zip according to the instructions/sew-along, but have to say I prefer my usual method sewing the whole seam, using basting stitch on the bit where the zip will go, press seam open, place the zip in centre, baste, the stitch in place, then remove the basting stitches. Even after I’ve finished this skirt, I can’t figure out if I need to do anything different because the skirt is lined. Time will tell. Here’s the lining – oh dear. I cut it with the pocket indents as per the pattern! I had to stitch the bits back on, as I didn’t have anymore fabric. It’s now a design feature. It is time Elna SU 62C and I document our friendship. We’re nearly the same age, and have known each other for 40 years now.